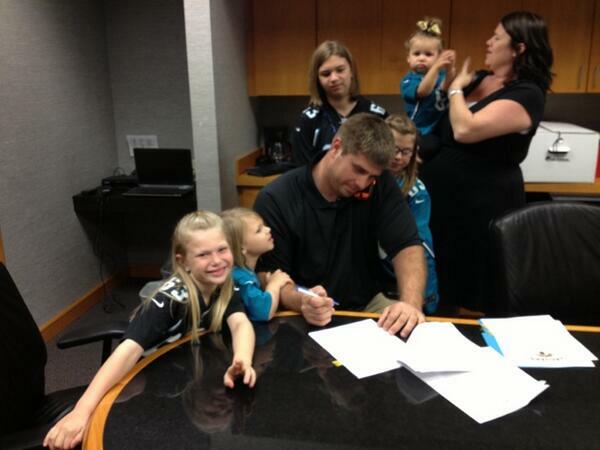 #jaguars agree to terms with C Brad Meester. Probably a 1 year deal. Good to have his veteran presence back. He'll be a good mentor for whoever is going to eventually take over at Center i guess. 2 sacks given up, 3 penalties. He's certainly not great anymore, but he's a solid piece to have while we groom others. AND She's pregnant with another daughter.... Can you imagine that household in 13 years? 5 Rich and spoiled girls all in varying stages of puberty. Brad Meester is a brave man. But did he play football for double digit seasons making millions? Yup. I'm also glad he'll most likely retire a Jaguar.